On April 22, the Department of Research Programming invited Mizutani Takeshi (The National Museum of Modern Art, Tokyo) and Marukawa Yuzo (National Institute of Information) to speak at a seminar on the dissemination of information on cultural properties and collaboration. 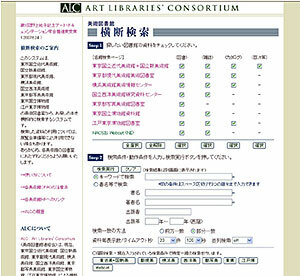 Mizutani and Marukawa have constructed and are engaged in the management of “ALC (Art Libraries’ Consortium),” a cross searching site on art libraries, and “So (Imagine),” an associative searching site, respectively. The Institute and the Department of Research Programming, in particular, that is in charge of disseminating high quality information on cultural properties, held discussions with the future in view. 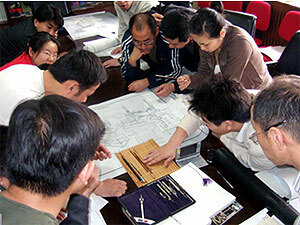 We plan to make conduct activities toward a more effective dissemination of the accumulated results of research. Until now, works of Kuroda Seiki were shown in the Memorial Room and the Exhibition Room on the second floor of the Kuroda Memorial Hall. From April 24, the former research rooms on the first and second floors have also been opened to the public. In the former research room on the second floor, a slide show entitled “The Life and Art of Kuroda Seiki” (12 mins.) is being shown so that visitors may better understand Kuroda’s art. 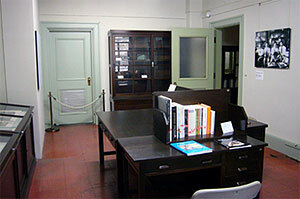 In the 2 research rooms on the first floor, a wooden desk, cabinet and photographs from the days of The Institute of Art Research are exhibited. 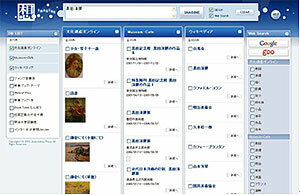 The most recent publications of the National Research Institute for Cultural Properties, Tokyo can also be perused freely. These new additions enable the visitors not only to appreciate Kuroda’s works but also to learn about the history of the Institute and its present work. Umemura Yutaka (June 15, 1923 – June 5, 2007) was a photographer who was in charge of the gravure pages of the magazine Engekikai. Last December, the Department of Intangible Cultural Heritage received negatives and photographs left by the deceased from his widow. Currently we are engaged in sorting out these materials to see how many there are. We hope to complete procedures for their official donation to the National Research Institute for Cultural Properties, Tokyo. Photographs by the deceased is said to have been first published in Engekikai in 1947, but the oldest negatives and photographs donated date to around 1962. More than 10 cartons of materials were transported to the Institute. They are valuable documents of a photographer who continued to take pictures of the kabuki world in the latter half of the 20th century. Science for Conservation is a periodical on scientific research related to the conservation of cultural properties. Since the inaugural issue published in March 1964, of which the first article was “The outline of the scientific researches for the preservation of cultural properties in Japan” by the then director of the Department of Conservation Science, Sekino Masaru, researchers of the Department who are committed to the mission of passing down to future generations valuable cultural properties that their predecessors have left to them, have been engaged in research and have continued to make the results of their research open to the public. The latest edition of the periodical, volume 47, contains 25 reports and articles including those related to the conservation and investigation of the mural paintings of Takamatsuzuka Tumulus and .Dunhuang Mogao Grottoes. Science for Conservation, as a book, is not for sale and can be read only at related organizations and universities, but all the articles that have been published until now have been make into PDF files so that they may be downloaded via Internet (http://www.tobunken.go.jp/~hozon/hozon_pdf.html). As a part of its project, Investigation and Research of Traditional Restoration Materials and Synthetic Resins, the Center for Conservation Science and Restoration Techniques has been conducting basic test for the improvement of weather-resistance of urushi-coated surfaces used on buildings. A stand for outdoor exposure test was placed at Taikicho, Hokkaido because the percentage of days with good weather is highest there in Japan, because it is easy to obtain data concerning weather, and because the annual hot-cold difference is great. From April 17 to April 18, sample test pieces of vermilion urushi and black urushi placed on the stand at the Taiki Multipurpose Air Park were inspected to see the condition of their deterioration. In this on-site investigation, the 8th-month inspection, the differences in deterioration depending on types of urushi-coating has gradually become clear. 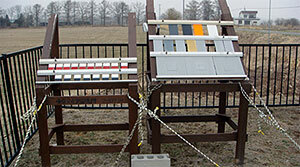 The first phase of inspection of deterioration due to UV light through this outdoor exposure test will continue until September 2008. 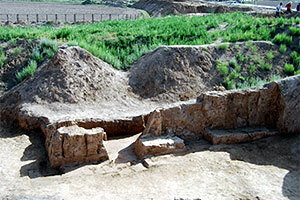 The Japan Center for International Cooperation in Conservation dispatched the 3rd mission of the UNESCO/Japan Trust Fund project, Preservation of the Buddhist Monastery of Ajina Tepa, Tajikistan from April 16 to May 9. The purpose of this project is the preservation of a Buddhist monastery made of mud bricks and/or pisé. The Center has been removing sand and weeds that have accumulated since past excavations and conducting archaeological cleaning and soundings since 2006 in order to clarify the position and structure of the walls of the monastery. In this mission, we carefully studied the southeast wall facing the courtyard where a stupa is located, and confirmed the entrance that leads to the room where Parinirvana Buddha had been once placed. In addition, as a result of soundings at two points on the edge of the site, we were able to detect the outer wall of the Buddhist monastery and to confirm its original size. Such results provide information valuable for the conservation of Ajina Tepa. 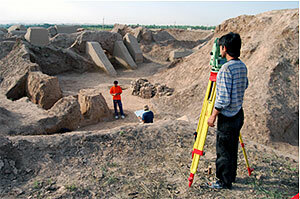 All archaeological investigations made at the site were done with young Tajik archaeologists, whose cooperation was of great help. 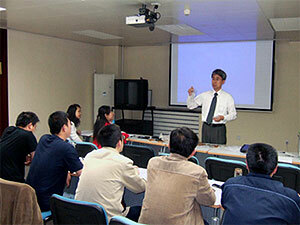 At the same time, we believe that it was meaningful from the point of view of capacity building of local experts.